Walton is doing quite well in the tablet arena for the past few months with the release of 3 tablets which are somewhat similar to each other having little differences between them. 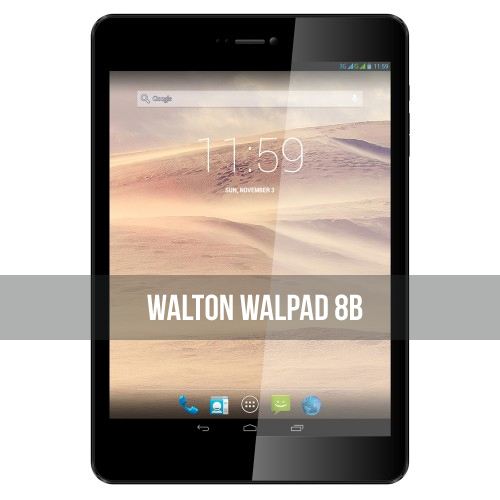 First up was the Walton Primo Walpad 7, then came Walpad 8, 8w and now they have officially announced another new tablet in the pipeline, Walpad 8b. From the name of the tablet, it can be easily deduced that the upcoming tablet will be retaining most of the features that were released in the earlier versions. Initially, the Walton Walpad 7 came out with a 1.2 Ghz Quad core processor, PowerVR SGX 544 as GPU, Android 4.2.2, 5.0 Megapixel rear camera, 2.0 megapixel front camera and a 4000 mAH battery. This tablet had a 7-inch Full HD screen with a 1280 x 600 in resolution. The Walton Walpad 8 featured somewhat the same specs except it having a larger screen size and an upgraded battery life. (4200 mAH). Although the name suggests it to have a 8-inch screen, it however has a 7.85 inch. Then came in a different version of the the Walpad 8 model, the 8w. It featured all the same specs as stated before but this time ensured this tablet had a 8-inch display screen. The next product, Walpad 8b is no different. The design language isn’t similar to the previous versions but the specs is still the same. Runs on the 1.2 Ghz Quad Core processor, has the same PowerVR SGX 544 GPU, runs on the late Android 4.2.2, has a 5.0 rear camera and down tunes 1.3 megapixel front camera. But there are some differences. The Walton Walpad 8b sports a whopping 5200 mAH battery! For now, this tablet has the highest battery power among all the released tablets. Moreover it also has a micro HDMI cable that will make it possible for the user to connect it to the PC or TV. The product is yet to be released but as a promotional offer, Walton will be giving away a free On The Go cable to those who will be buying this product.